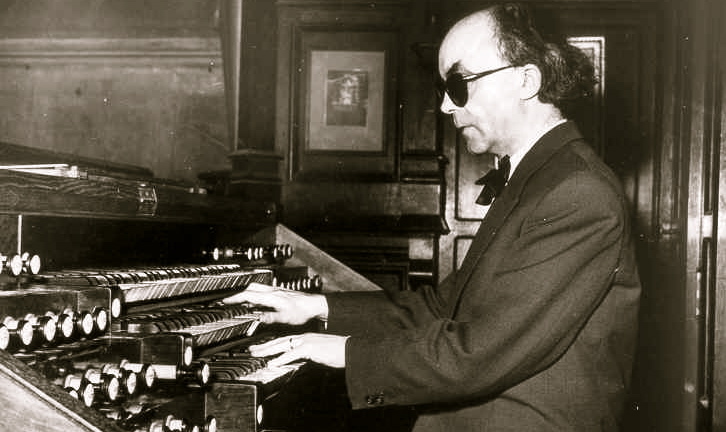 David Adams plays organ works by Stanford, Dvorak, Brahms, Beethoven, Franck,and, by Jean LANGLAIS, "Chant héroïque" (9 Pièces). Bruno Mathieu plays works by Wagner, Widor, Dubois, and, by Jean LANGLAIS, "Orage" (Troisième Symphonie). For All Saints service, organist, Christopher A Sanard plays "Feux d'Artifice" (Rosace) for the voluntary. "Gloria, A celebration of 20th century French music", The Stondon Singers, Lawrence Lyndon-Jones, orgue, Christopher Tinker, direction. To celebrate the Gloria in 20th century French music, The Stondon Singers, under the direction of Christopher Tinker, sing Poulenc's Gloria, Duruflé's 4 motets on gregorian themes and Jean LANGLAIS "Messe Solennelle", Lawrence Lyndon-Jones playing the organ. Peabody's organ students play at Friday noon concerts works by Widor, Vierne, Alain, Litaize, and by Jean LANGLAIS," Fête"
Nathan Degrange-Roncier gives an organ recital with works by J.S.Bach, Widor, Vierne,and, by Jean LANGLAIS, the First e Esquisse Gothique (Trois Esquisses Gothiques) and "Chant de Paix" (9 Pièces). High Mass, The Twenty-Third Sunday after Pentecost, The Choir of the Church of the Advent, Mark Dwyer, conductor. For the High Mass of the Twenty-Third Sunday after Pentecost, The Choir of the Church of the Advent, dir. Mark Dwyer, Katelyn Emerson, organist, performs Jean LANGLAIS "Messe d'Escalquens" along with works by Wachner and Lallouette. Katelyn Emersonplays works by JS Bach, Sweelinck, Schumann, Rheinberger, Widor, Sowerby, Dupré and, by Jean LANGLAIS, the "Sonate en trio" (1967). Dalaie Choi jplays organ works by Pachelbel, Bach, Bolcom, Liszt, and, by Jean LANGLAIS, "Fête". For the celebration of the 20th anniversary of the Sacred Music Center in Le Puy's Cathedral, for the 33h Sunday Mass, the Choirs of the Cathdral will perform Jean LANGLAIS' "Salve Regina Mass" for Men's choir, unisson choir, 2 organs and Brass. Graeme Morton conducts The Brisbane Chamber Choir, The Choir of St John's Anglican Cathedral in Brisbane (Australia) and The John Colton Brass Ensemble in vocal works by Gabrieli and Jean LANGLAIS' "Salve Regina Mass" during the Choral Eucharist. The Organ Voluntary will be also Langlais' "Acclamations carolingiennes" (Suite Médiévale) at this service. French Mezzo Soprano Marie-Elizabeth Seager will present a recital with works by Ireland, Mahler, de Falla, Duparc, Schubert, and, by Jean LANGLAIS, an "Ave Maria" for voice and organ (premiered in United Kingdom).